We love supercars for their mind-bending performance, but there aren’t many places where you can experience the incredible speeds they were designed for without getting arrested. But you can drive them flat-out on a race track, and the Scuderia Society of supercar owners descended upon Circuit of the Americas this weekend to just that. Scuderia Society hosts events for exotic car owners with a focus on giving back to children’s charities. 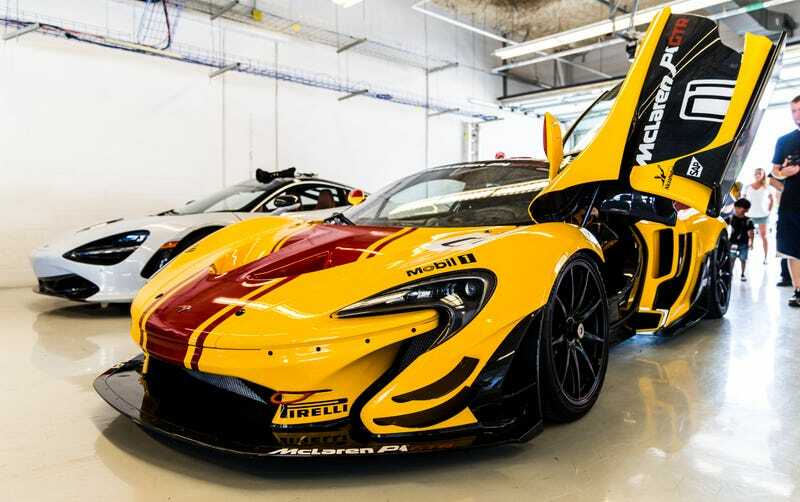 They teamed up with McLaren Houston to host a Senna: Driving Instinct event this weekend that let owners rip around the United States’ only Formula One track and the chance to view some rare sheet metal in person, including a McLaren P1 GTR, a Porsche 911R and even an ultra-rare F1-inspired pod-car called a Tramontana XTR. McLaren corporate was even on hand at the event to let participants test out new McLaren 570GTs on the roads around the track that were brought in as part of a McLaren test drive tour. Of course we took one for a spin, too. Sure enough: the 570GT is still fast and just the right size for a fun car. All photos credit Kurt Bradley. America’s first 720S. The first McLaren 720S sold in the United States belonged to a participant, whose owner tracked it until the tires lost most of their grip during the hot summer day but kept offering rides anyway. Let’s face it: less grip can be fun, too. That’s the great thing about track weekends, and why every enthusiast should make their way to one at least once in their lives. People are so eager to share their cars, and you see a lot of the rad fast cars and special editions most people only see in car publications. It’s the kind of open, friendly atmosphere that reminds you why you got into cars in the first place. But enough of me talking about it. Let’s enjoy some photos of some incredibly fast and rare cars. The headlights are split open to channel air into a radiator hiding behind them, which is one of the neatest things I’ve seen on a supercar. Me testing out one of the 570GTs and making a solid “not bad” face. This one didn’t go on track, but I sure wish it would have! Oops—one of the McLaren P1's charging flaps came open, but it was still insanely fast.